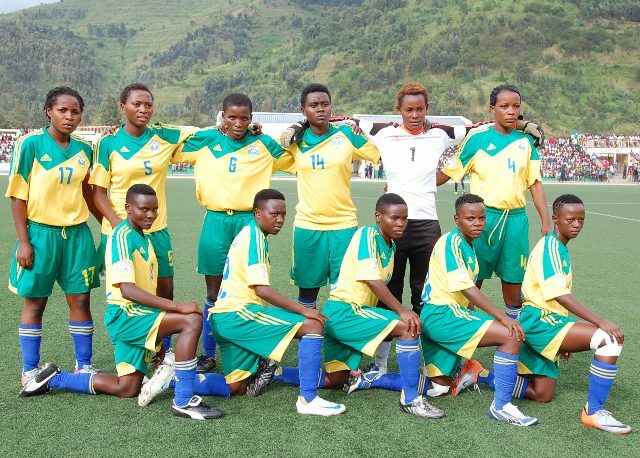 The Rwanda women’s national football team represents Rwanda in women’s association football and is controlled by the Fédération Rwandaise de Football Association. It had to date been schedule to compete in one major tournament, the inaugural Women’s Challenge Cup held in Zanzibar in October 2007, but the event was ultimately canceled. It has finally debuted in February 2014 against Kenya. Like their male counterpart, the team is nicknamed The She-Amavubi (Kinyarwanda for The She-Wasps). It has never qualified for an African Championship finals or a World Cup. Until 2012, Rwanda had yet to play in a single FIFA recognised match.FIFA did not recognise a senior women’s national team in the period between 2002 to 2006, with no team existing by 2008. While Rwanda women’s national under-20 football team existed and played in matches by 2009, the senior national team was not competing in matches in the period. There was no senior team competing in the 2010 African Women’s Championships during the preliminary roundsor the 2011 All Africa Games. In March 2012, the team was not ranked in the world by FIFA and a senior national team still did not existed. However, a senior national team played its first official match on February 16, 2014. The inaugural Council for East and Central Africa Football Associations (CECAFA) Women’s Challenge Cup was supposed to be held in Zanzibar October 2007, an event Rwanda was planning to send a national team to compete in, but the competition was ultimately canceled. The competition was to be funded by Confederation of African Football. The Council of East and Central Africa Football Associations secretary, Nicholas Musonye said of the event, "CAF wants to develop women football in this region in recognition of the milestones CECAFA has achieved over the years. CAF appreciates what CECAFA has done despite the hardships the association has gone through, from financial problems to political instability in member states and poor management of associations. Member states in the CECAFA region have not taken women’s football seriously. CAF now wants to sponsor a long-term campaign to attract women from this region into the game." It has debuted on 16 January 2014, in the 2014 African Women’s Championship first qualification round, against Kenya in the StadeRégional Nyamirambo in Kigali, where they win 1–0 by a goal scored by Alice Niyoyita at the 29 minutes in the first leg, in the second leg, in Kenyatta Stadium, Machakos, Kenya they lost 2–1, with a goal of Jeanne Nyirahatashima. Rwanda qualified to the second round by away goals rule after finishing 2–2 in aggregate and will play against Nigeria. Its third official match was disputed on 13 May 2014 against Zambia and ended in a 3–0 loss, making it the third loss of their record. They disputed the 2014 African Women’s Championship second qualification round with Nigeria in 24 May 2014, losing 4–1, with one goal of Clementine Mukamana at the 53 minutes. In the second leg, again with Nigeria in 7 June 2014, the She-Amavubi lost by a crushing 8–0 defeat, leaving them out of the 2014 African Women’s Championship by 12–1 in aggregate score.